Rosemary DiCarlo, Under-Secretary-General for Political Affairs, briefs the Security Council on the situation in the Middle East. “As we work towards a full lifting of the closures on Gaza, in line with Security Council resolution 1860 (2009), I call on all parties to ensure that urgently needed humanitarian supplies reach the Strip. These should not be held hostage to political and security developments,” Ms. DiCarlo said. Turning to Gaza’s “crumbling” infrastructure, Ms. DiCarlo reported that the UN is increasing its capacity to better support projects in the areas of energy, water, health and job creation. “While Israel has a duty to protect its citizens, it must exercise maximum restraint in the use of live fire, and refrain from using lethal force, except as a last resort. I further call on Hamas to avoid violence at the fence and refrain from putting children in harm’s way. Children should never be targeted or instrumentalized in any way,” she said. 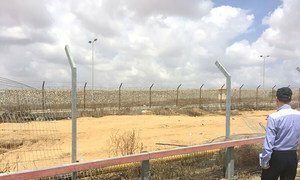 The decision by Israel to reopen the only functional commercial crossing point into Gaza which has been closed to most deliveries for weeks, has been welcomed by the United Nations Secretary-General.